We got some questions about PMEGP (Prime Minister's Employment Generation Programme) Loan and Mudra Bank Loan (Micro Units Development & Refinance Agency). Which loan should we take and which is best and better business loan provide scheme by government. So, here is detail analysis of PMEGP and Mudra Bank. In 2008, UPA Govt has announced PMEGP Loan Under Ministry of Micro, Small and Medium Enterprises. The main objective of PMEGP is to generate employment opportunities in rural areas and also in urban areas.To create more continuous and sustainable employment to works with high wage rates. 1. You can get maximum business loan up to Rs.25 lakh. 2. For Service Sector, Rs.10 lakh maximum loan. Mudra Bank Yojana was announced in last budget by finance minister of india, later prime minister narendra modi has inaugurated the Mudra Bank Yojana. You can check more about level of funds, benefits of Mudra Bank and key objectives of Mudra Bank. 1. Since, PMEGP Was for Manufacturing unit and service units in business or service sectors, while Mudra Bank is only focused on Micro Units Development (for which Up to rs.10 lac of loan is given). 2. PMEGP was dived in 3 segments of Rural and Urban with due respect of General category, ST/SC/OBC caste category, while Mudra bank is divided in Sishu, Kishor and Tarun Category of Business (there is no caste based category for business loan in mudra bank scheme). Even General category person will get same funding despite being from Urban or rural areas. 3. In PMEGP, 27 Public Sector Banks and All Regional Rural Banks and co-operative banks was included while in Mudra Bank, All commercial Banks in public and private sectors (co-operative) banks are included. 4. In PMEGP, KVIC (Khadi and Village4Industries Boards (KVIBs) supports entrepreneurs by giving subsidies, But There is no specific subsidies mentioned for Mudra Bank Yojana. 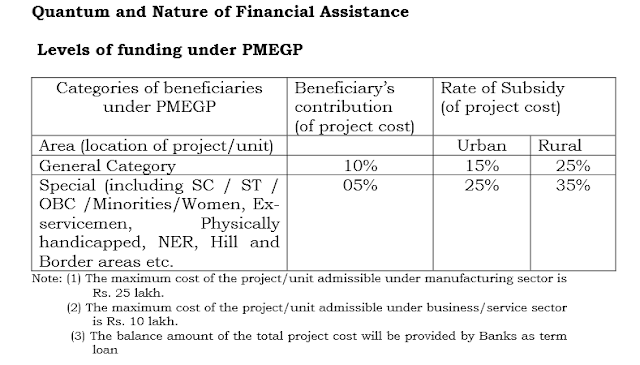 You can Read more about PMEGP Scheme here >> http://msme.gov.in/guidelines_pmegp_24092008.pdf. How to take or Apply for PMEGP for Mudra Bank Loan? To Apply for loan from PMEGP or Mudra Bank, all you have to do is to contact the nearest bank and ask for the Application form for Business Loan. PMEGP or Mudra bank is NOT a separate bank, is one of functionality/government scheme which is provided by all public/private sector banks in india. Learn More about MUDRA Bank from this link. If you have any question or query, you can ask us in comment below, Thank you!